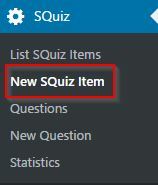 To start all kinds of items find the SQuiz menu on top of the WordPress menu. decide if you want to randomize questions, show review at end (only quizzes), time limit and passing score. After that you have to save the quiz otherwise you cannot add questions. You should have already created some questions for your quiz, otherwise you must do that now. Questions on the left side are available, on the right already assigened to this quiz. 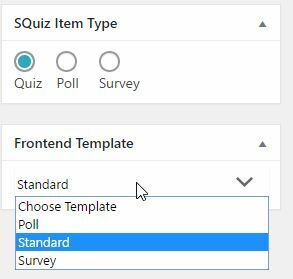 Simply drag questions to the right to add them, click the remove button in the upper right corner to remove them from the list. You can filter the available questions by category and type. Every update of this list will be saved dynamically by AJAX. In case of polls you can add more than one question, but this don’t has any effect to the frontend: Only the first question will be available for the visitor.